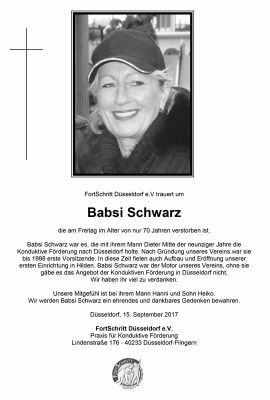 FortSchritt Düsseldorf mourns our Babsi Schwartz who died on Friday aged only 70. It was Babsi Schwarz who, with her husband Dieter, brought Conductive Education to Duesseldorf in the mid-nineties. After the founding of our association, she served as its first chair until 1998. This time also saw establishment and opening of our first facility in Hilden. Babsi Schwarz was our association's engine. Without her there would no option for Conductive Education in Düsseldorf. We owe her much. Our sympathy goes out to her husband Hanni and son Heiko. We shall keep Babsi Schwarz in honourable and grateful remembrance.